The humble apostrophe may be small and trivial to some, but its correct usage brings disproportionate pleasure to all us grammar geeks. My personal bugbears are apostrophes used in plural nouns or decades (1980’s makes me cringe every time), or when it’s is used instead of its and vice versa. Apostrophe mistakes are everywhere – in newspapers, adverts and promotional flyers, on shop signs, menus and van livery… And let’s not even get started on websites and social media! 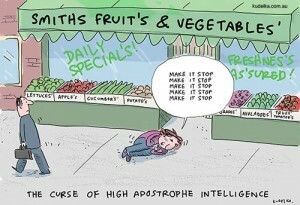 So it seemed only fitting that my first grammar-based blog should be devoted to the thorny subject of when and where to use apostrophes and – equally important – when NOT to use them. They are NOT used for possessive pronouns (like hers), noun plurals, proper names or numbers. This handy infographic by Mary Kay Mann neatly summarises apostrophe rules with the help of some cute feline friends. In particular, I like the explanation she gives for joint possession but the one not properly explained here is the use of apostrophes with all-capital abbreviations. Mary recommends using an apostrophe with acronyms containing full stops but doesn’t cover what to do in the case of those without. The general rule is not to add an apostrophe to acronym plurals such as ABCs or GCSEs. Hopefully this answers any questions you had about when and where to use apostrophes. If you’re still unsure about any of the rules, let me know in the comments below and I’ll do my best to help.